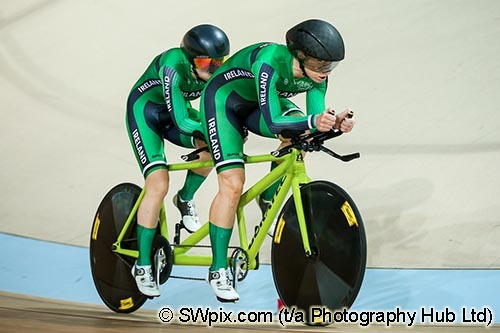 Katie-George Dunlevy and Eve McCrystal have won a bronze medal in the Women’s B Tandem 3km Individual Pursuit tonight at the at the UCI 2018 Para-cycling Track World Championships today, beating New Zealand into fourth place. 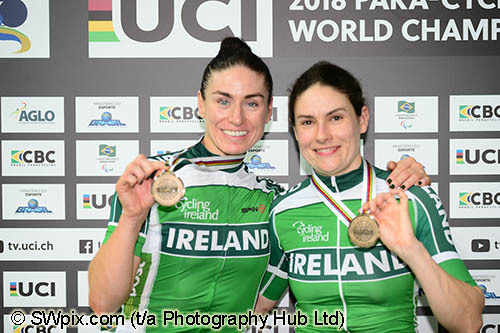 2018 UCI Para-Cycling Track World Championships - Rio de Janeiro Municipal Velodrome, Barra da Tijuca, Brazil - Katie-George Dunlevy piloted by Eve McCrystal of Ireland win Bronze in the Women's B 3km Pursuit final. After qualifying for the Bronze medal ride off earlier today, the Irish duo started the 3km race against the clock as favourites, having qualified with a 5 second advantage over New Zealand. In the medal ride off they bettered their time by 2.5 seconds, clocking 3.34.23 on the line. Gold went to Great Britain, leaving the Belgians to settle for silver. While the Irish pair had qualified comfortably for the bronze medal final, they were determined to better their performance from earlier in the day. After the first qualifying round they made a few adjustments to the bike before bettering their time by 2.5 seconds, with a faster time than eventual silver medallists Belgium. “We had to be realistic coming into this event after limited track time which was not enough to come in and beat the best – which on the day was the brits. But we gave it our all. 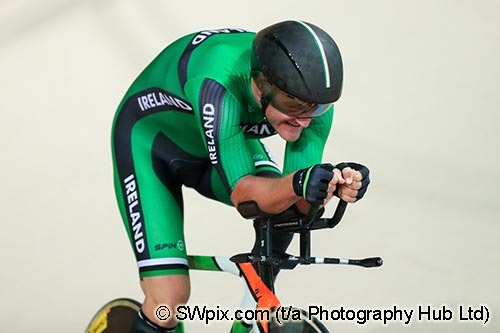 2018 UCI Para-Cycling Track World Championships - Rio de Janeiro Municipal Velodrome, Barra da Tijuca, Brazil - Colin Lynch of Ireland competes in the Men's C2 1km Time Trial final. Earlier today Colin Lynch finished 15th in the MC2 1km Time Trial with a time of 1.26.577 and Peter Ryan and Sean Hahessy finished 8th in the M B Tandem 4km Individual Pursuit, with a time of 4.25.505. Lynch also competed in the MC2 Scratch qualifiers but will not progress to the MC1-3 Finals on Sunday. Tomorrow Dunlevy and McCrystal turn their attention to the 1km Time Trial, with both male tandems competing in the men’s event. Sprint specialists Martin Gordon and Eamonn Byrne will be kick starting their world championship campaign with the 1km race, along with Ryan and Hahessy. Ronan Grimes competes in the MC4 Individual Pursuit. Paralympic and Double World Champions on the road Katie-George Dunlevy and Eve McCrystal have qualified for the bronze medal final in the W B Tandem Individual Pursuit at the UCI 2018 Para-cycling Track World Championships today. Their time of 3.36.776 over the 3km race of truth was enough to rank them third, with bronze within their grasps tonight. The duo will compete against New Zealand who finished 5 seconds adrift in fourth with 3.41.509. In the men’s event, Peter Ryan and Sean Hahessy finished 8th in the M B Tandem Individual Pursuit, with a time of 4.25.505 for their 4km race. The World Championships take place in Rio de Janeiro, Brazil from the 22-25 March. Dunlevy and McCrystal have proven their prowess on the road, dominating on world level last year in both the road races and time trials. This year they have switched their attention back to the track and are already guaranteed a higher finish position than their 5th place at the Paralympic Games. The Irish bike will be competing against New Zealand’s Amanda Cameron and Hannah van Kampen who pipped them for fourth place at the Paralympic Games, and they are not taking bronze for granted, despite their 5 second lead ahead of the race. The bronze medal final takes place at approximately 8pm this evening, Irish time. Also in action is Colin Lynch in the 1km and the Scratch Race qualifiers. Read more about Katie-George Dunlevy’s cycling journey HERE. The UCI 2018 Para-cycling Track World Championships take place in the Velódromo do Rio, Brazil from the 22nd – 25th March.